I know how he feels, looks so refreshing! Cute elephant! Thanks for a nice picture to take to my dreams tonight! I finally got a chance to try making egg sheets for the first time yesterday - I used your tutorial and they were great! Thank you so much for your clear and easy to follow instructions!! Little eggy elephant is extremely cute! Oh this made me smile! This is actually a bento my K will eat up! Uh, minus the asparagus. lol. Your bentos are always so beautifully presented Lia. I just love looking at them. So cute Lia! The elephant is adorable! So cute bento!! The hearts in the background, you arrange everything so beautifully! So original and wonderful, Lia! Your creativity never runs out...love this happy little elephant. Thanks for the smile!! 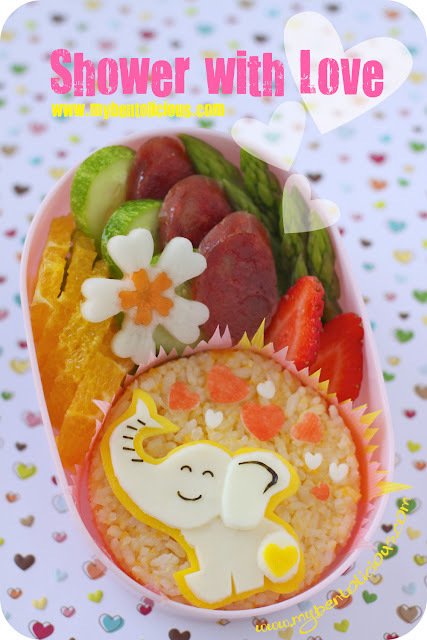 What a cute elephant bento!